Happy Friday! We had a superb Christmas filled with friends and family. K raked in some squeal-inducing gifts (the expression when she saw the gigantic Yamaha keyboard box with her name spelled out with red camo duct tape was pure gold: “Mommy! There’s a present for me that’s bigger than our couch!!”). 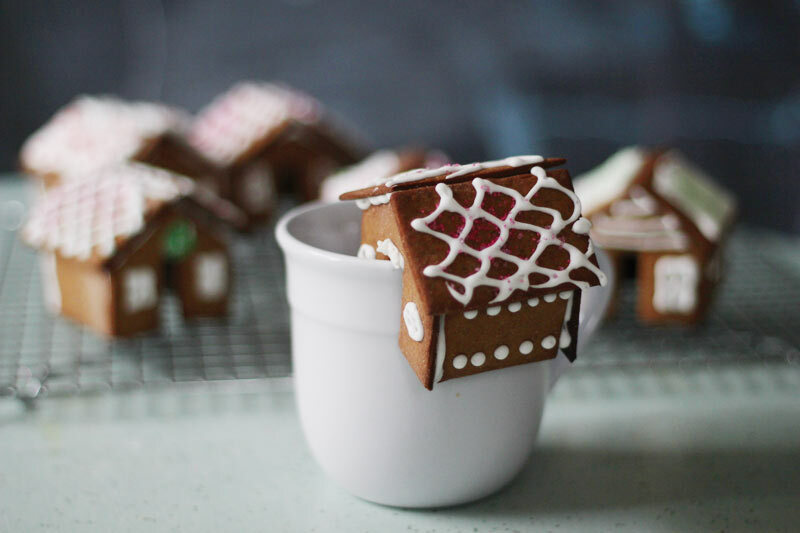 One of the things I really enjoyed on Christmas Eve was making miniature gingerbread houses that perch on the edge of mugs. I used Not Martha’s template and recipe recommendations, and though they were time-consuming all around, I was totally into it. I need to re-examine my priorities, as it was actually a little disconcerting how zealous I was about this. 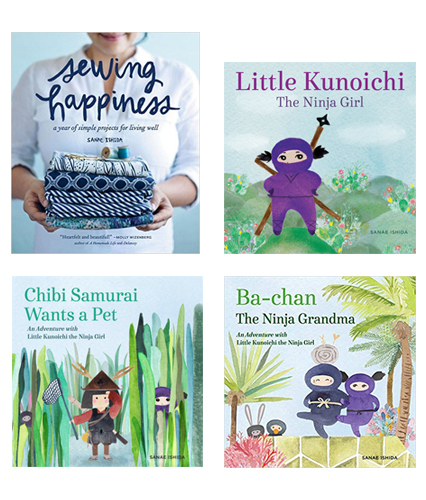 Also, I’ve said I don’t like to make the same thing over and over, but I realized that only applies to sewing. I could have made dozens of these (I ended up with 6 that didn’t fall apart). K jumped in to help too, wielding the icing bag recklessly. The icing got smudged in parts and I obviously need some training in the decorating department (K was far more expert than I was), but they are almost painfully adorable, no? We went to a fabulous Christmas gathering at our neighbors’ and the kids enjoyed the handmade peppermint cocoa with the mini gingerbread houses. Talk about a sugar rush. And as I suspected, with all this celebrating and baking and gift-wrapping and giving, I had zero time or focus for sewing for myself. My poor dress is still lounging about in a semi-done state. I usually barrel through projects until completion, but despite the subtly shimmery fabric, this dress was starting to emit a stodgy uniform vibe, and my motivation flagged. 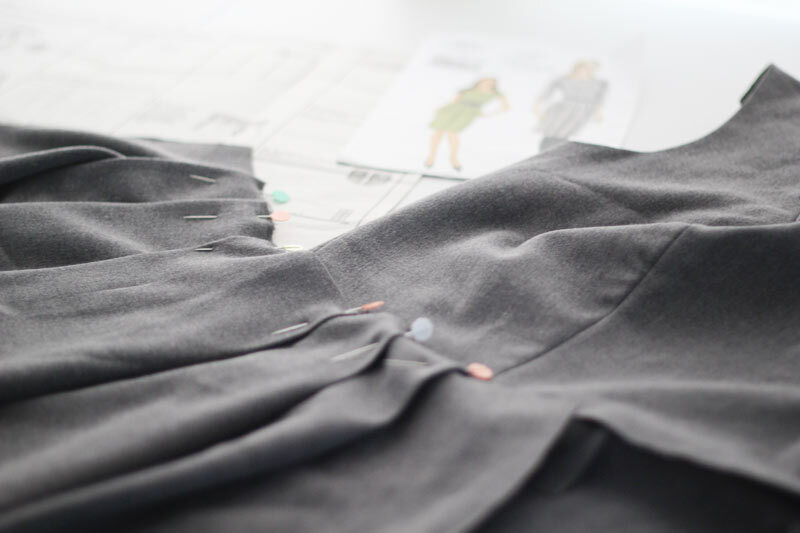 It’s Vogue 8511 (I’m sewing the sleeveless version), and I’m shooting to get it done in the next couple of days. So, I have quite a few things brewing behind the scenes over the next few weeks, and there’s a mighty good chance that postings will be on the haphazard side for a while. I love to post every weekday, so we’ll see. I will definitely be back on a regular schedule by about mid-to-late January, but in the meantime, I’ll most likely be popping around with what I hope to be fun posts every few days. A friend showed me this linguistic quiz that determines your home city, and it’s uncanny how accurate it is. It’s US-based, but a world-wide version would be so fun! *And you, my dear readers, made it extra awesome! Thank you, thank you, thank you. Have a wonderful weekend, all! Have a lovely weekend away. I love the idea of gingerbread houses as birthday cakes! We went to a holiday party tonight and I had some leftover gingerbread cookie dough, so I made some unfrosted, round cookies to take with me and they were a huge hit. Without the frosting/icing, the cookies aren’t too sweet and hit just the right note of subtly spicy. Merry Christmas, Sanae! My dialect quiz landed me squarely in Portland/Vancouver, Seattle, and…RENO? whatever, I’ll take it. Enjoy your weekend away! We’ve done it a few times (the kids are always ecstatic to stay with grandparents) and it’s amazing how recharging it is not to have to worry about all the “kid stuff” for a little while. Reno, huh? So funny, Kristin! Now that we’ve gotten one sort of successful trip under out belt, I think future trips will be easier! Wish I could take that quiz – sounds so fun! Born and raised till 18 in Canada though, so won’t apply. So glad you had such a lovely Christmas! And how wonderful that your mom is able to be here with you for the holidays. 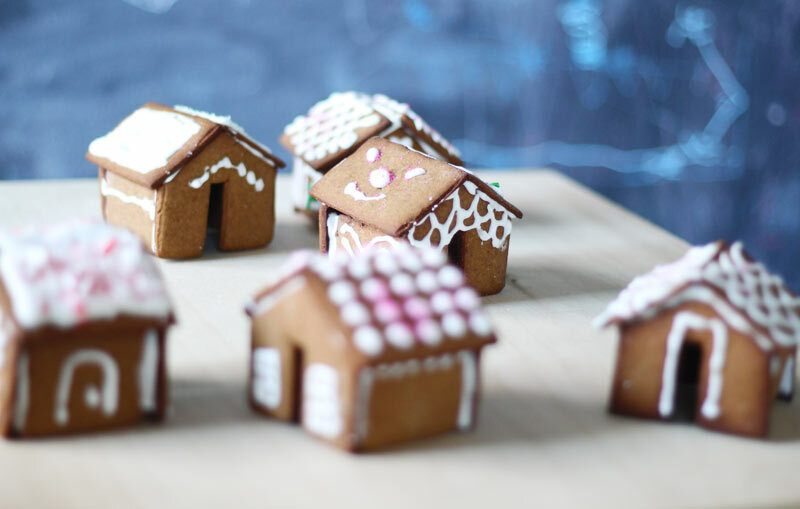 Those gingerbread houses are the epitome of adorable! And good for K for being so good with the icing bag:) I just relinquished control over the icing bag this year at our own gingerbread house making fete, and was dismayed to see I was not really needed after all! Although I will be sad to see less of you on the blog in the coming weeks, I’m beyond excited for the ventures you have on the horizon! 2014 sounds like it will be off to a fun start:) I will be eagerly staying tuned. And yay for over-night getaways! Good for you, and bless your mom’s heart for watching K. I hope you and M have a wonderful time and find it to have been worth the wait:) Have fun! those little houses are so cute! 🙂 My hubby and I are headed out of town this weekend too, two nights without kids for our anniversary!! I’m so excited :). I hope you have a great time. Enjoy it and don’t worry about K she’ll be having a great time with grandma. Happy Anniversary! Hope you have a delightful getaway, Kristi! Oh, enjoy your weekend away! I think our sweet baby will probably be about seven before we leave her for a night. We’re big softies, too 🙂 I love that linguistic quiz. I was pretty spot on- all three cities were in the Carolinas. Have you ever seen that blog meme that went around a couple of years ago where people videoed themselves answering certain questions about language? I wanted to do it but chickened out. 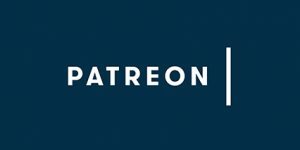 It’s pretty interesting to hear a voice to a blog you’ve been reading for some time. I haven’t seen that meme, but now I want to! It would be fun to match the voice to the faces, though I think you’d all have to plug your ears when you hear the screechiness of my voice. 🙂 And apparently, I sound VERY Los Angeles. The quiz is cool! I live in Vancouver, BC and my closest matches came up as Seattle, Tacoma and Vancouver, Oregon. So, fairly accurate! I think there is a lot of linguistic similarity along the northwest coast. Oh, that is cool! So fascinating to see the linguistic influences of various regions. I especially found interesting the questions where I had to answer “I have no term for that”. Love the cup houses!! And, I took the language/accent/regionalism test and it was scarily accurate for me. It even identified the various areas of the U.S. in which I’ve lived – not just my hometown. That’s really interesting…my results included Los Angeles (where I’m from) and a couple of other cities closer to northern California. I lived in San Francisco and now call Seattle my home, so maybe the other options took that in account? That linguistic quiz was very cool! I’m in Vancouver BC now, but it totally identified where I used to live in the States. And I totatlly agree that the west coast has a very similar way of talking.